Popularly known Maxstor is one of the leading manufacturer and exporter of the workbench providing a great range of the workbenches. We also offer customized workbenches with wide variety of options. 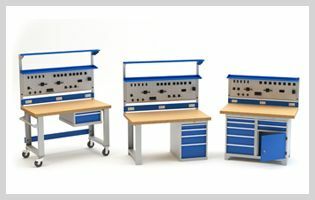 Our robust workbenches are highly demanded in many industrial and commercial applications. Our workbenches are available with various options of bench tops, cladding options, perforation panels, adjustable drawers and shelves and other configurations. We provide Industrial Assembly Workbench, Adjustable Height Workbench, Industrial Workbench, Mobile Workbench, Assembly Workbench and tailor made workbenches as per demand. Our workbenches are equipped with many essential attachments as its applications. It is also provided With the technological improvements of various industrial methods, we have improved our design of workbenches to make suitable option for the appropriate application. It is highly demanded for the diverse applications in many industries. It is available with various table top options, perforation panels and vices. It is made to provide maximum working space and conditions. Workbench top provide effective protection against grease, dirt, oil and water. We offer adjustable shelf for convenient arrangement of respected tools or products. Power supply option is offered for the application of power tools. Provided with multiple tops options like 19 mm, 32 mm and 52 mm.